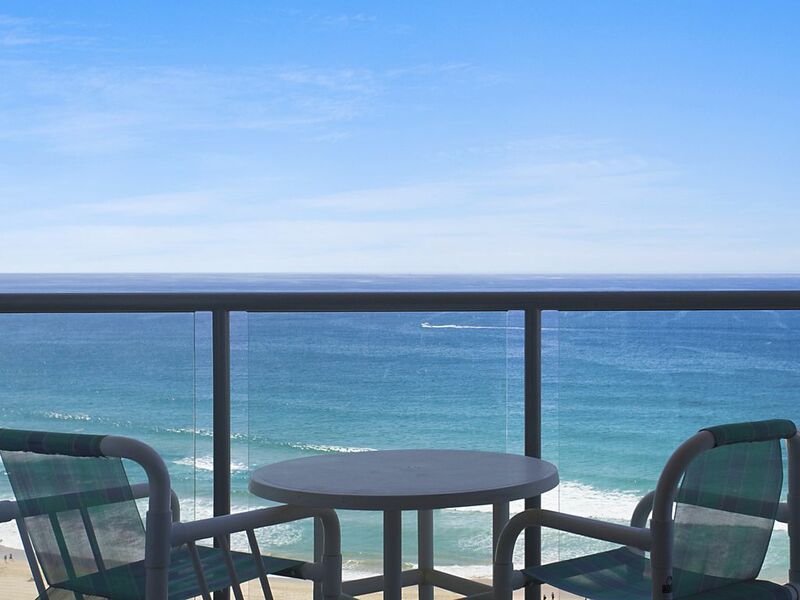 THIS LUXURY 20TH FLOOR APARTMENT offers not only modern amenities but boasts fabulous views of the famous Surfers Paradise beach and the beautiful coastline. A contrast to this day vista is the spectacular night lights of the surrounding area. Relax on the balcony and take in the magic after a day spent on the beach, or hiring a boat to cruise the canals and swim on secluded beaches. The Peninsula Apartment complex has three pools (one indoor & one outdoor are heated), sauna, gym, tennis courts, children's play area and BBQs. The location is particularly quiet. It is ideally located only 50m from the patrolled beach, 200m to Cavill Mall, (Surfers Paradise shops and restaurants) and 50m to the light rail station which provides a short eight minute ride to The Star Gold Coast Casino, Convention Centre and the iconic Pacific Fair shopping complex with over 400 shops. Apartment 20F Peninsula Apartments offers modern luxury with funky art influences at an affordable price, absolutely perfect to ensure your stay is memorable. - FREE WIFI AND FOXTEL! - Beautifully tiled throughout lounge/dining area which opens onto a full length wrap around balcony. - Fully equipped kitchen with modern appliances. - This apartment is also perfectly located if you wish to skip cooking and try the local restaurants instead. - Master with queen bed and en suite bathroom with walk in double shower. - Second bedroom with 2 single beds. - There is a separate guest bathroom with a walk in double shower. - Separate laundry with clothes dryer. - This classy apartment is fully furnished with quality inclusions and is air conditioned in the living room. - Ceiling fans provided in the bedrooms as well as living room. - Complimentary secure parking space for the duration of your stay! As these are not serviced apartments, we provide a starter pack for your initial convenience consisting of: tea/coffee/milk, toilet paper, shampoo, body wash, sachet of washing and dish washing powder and soap. Guests are expected to purchase extra supplies as needed. As these are not serviced apartments, we provide a starter pack for your initial convenience consisting of: tea/coffee/milk. Guests are expected to purchase extra supplies as needed. Spacious, clean, comfortable, with fantastic ocean views in a secure building. Great location close to shops and restaurants. We loved watching the sunrise from the balcony. We found everything we needed and very much enjoyed our stay. Thank you for your lovely response. We are glad you enjoyed your stay and hope to have you back in the future! the place was exactly like how it was in the pictures. Stones throw away to the beach and to the sky point observation deck. The views from all the rooms were splendid. Not forgetting the balcony where we spent a lot of time looking at the beach! Highly recommended! We will be back again! Beautiful outlook. Clean, well appointed apartment. Thanks so much for your positive feedback. We are thrilled to hear that you enjoyed your stay and look forward to hosting you again in the future! Very happy with the apartment everything we were looking for. The property was fantastic, and well maintained. The children loved the pet lizard in the garden area. The place looks exactly like the photos. The beds were comfy, the view was amazing, and absolutely everything thing you need is within walking distance or a short uber or tram ride away. I will definitely be back.